Have you ever looked up the dictionary definition of “overwhelm”? It’s pretty intense, actually. When you’re overwhelmed with too many priorities, it can feel impossible to find the time you need to get everything done. Even worse is when everything is important. How can you possibly put aside 99% of your responsibilities for a few hours in order to focus on just one thing? I don’t know about you, but I used to feel guilty at neglecting all the other important things I wasn’t doing, when I would try to focus on at least one thing that was important. It’s nonsensical that you can work on everything all at the same time. But who says we humans are rational, sensical people? What urgent issues do you have right now? What areas of responsibility are you managing? 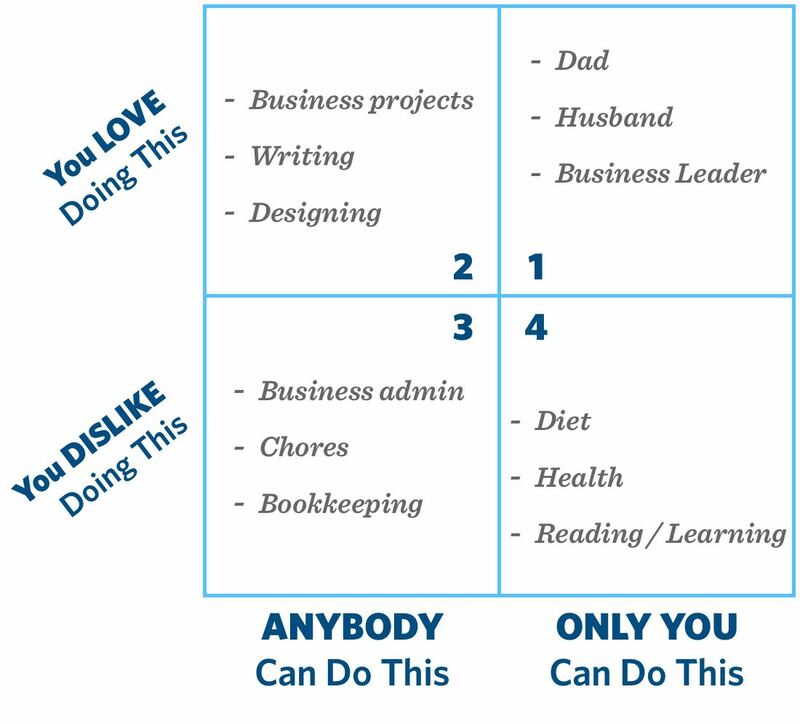 What things do you feel that you should be doing but you’re not? Now, looking at those boxes, how does it make you feel? The items in boxes 1 and 4 are things which you must choose to take personal ownership of and prioritize into your life. What things are in Box 2? It’s awesome that these are things which you love, but make sure they’re not keeping you from the things in Box 1. What things are in Box 3? These need to go! Delegate them to someone else. Get assistance, learn how to automate the process of that work, ask your boss if you can be relieved of those duties, etc. 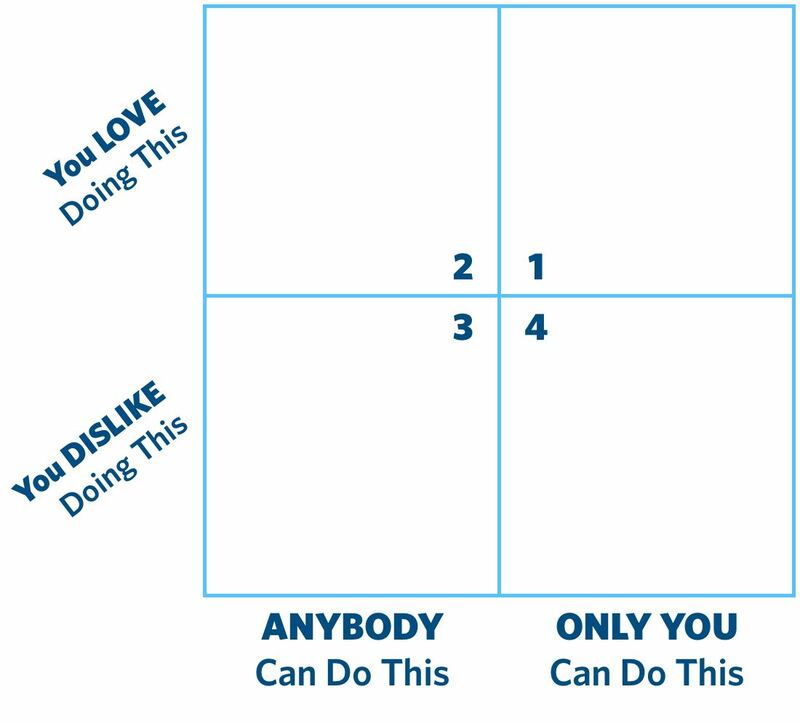 Looking again at my matrix above, let me share a few insights. You’ll see that I put writing and project management in Box 2. The truth is, my job within my company as a writer, designer, and project manager is totally replaceable. Even though those activities are critical to what we do, I could train someone else to do that work. But what’s NOT replaceable within the company is my leadership as the owner. My taste, values, and vision for the work we do are unique. Therefore, if the work I’m doing in Box 2 begins to interfere with my responsibilities in Box 1, then guess what? Time to make a change. I love looking at the things in my life that ONLY I can do, and nobody else can do for me. Only I can be a husband to my wife. Only I can be a father to my kids. Only I can take care of my health by eating well and staying active. Only I can lead my business in the direction I want it to go. Only I can take responsibility of my personal development through reading, learning, and living a focused life. It’s liberating to know exactly what I’m in charge of. When you’re feeling buried under a mass of so much stuff, it can feel as if you’re responsible for everything in the whole world. But it can be liberating when you step back and get clarity about the things that ONLY YOU can do. By the way… those things in Box 4? The the things you don’t like, but that only you can do? Here’s a tip: Put systems in place that help you automate those things. Habits and routines help keep important areas of your life on track even when you can’t — or don’t want to — give those areas your full attention.